West Liberty-Salem’s Selena Weaver eyes the rim during a free throw attempt against Northeastern on Thursday. SPRINGFIELD – West Liberty-Salem eviscerated hapless Northeastern, 65-14, in OHC girls basketball on Thursday. “They still come out focused and they still play hard. It’s tough sometimes, but we like the things they’re doing and the seniors are keeping everyone together and that’s all we can ask them to do right now,” WL-S Coach Dennis McIntosh said. The Tigers had an insurmountable 38-4 lead at halftime. For WL-S, Gabby Hollar had 13 points, Kelsey Day had 11 and Selena Weaver added 11. Most of the starters rotated minutes in the third quarter and didn’t play in the fourth. The Tigers did just that, outplaying the Jets at both ends. A lull might be expected during the stretch the Tigers are on, but McIntosh insists nothing changes. “We keep practice basically the same. We try to keep our intensity up. You play the way you practice. If you go out and go at half speed, that’s the way you’re going to play in games. This has been a great group that really follows that. They come out and work hard and then they go out and play hard,” he said. In the jayvee game, WL-S won, 25-12, in two quarters. Hallie Smith scored 7 points for the Tigers. On Wednesday, the WL-S varsity routed Madison Plains, 60-19, in OHC action. The Tigers led, 33-10, at the half. For WL-S (13-3), Kelsey Day had 18 points and Selena Weaver added 16. WL-S won the jayvee game, 28-24. Grace Winters had 9 points for the Tigers. West Liberty-Salem, which has won 13 straight games, hosts Fairbanks on Saturday. 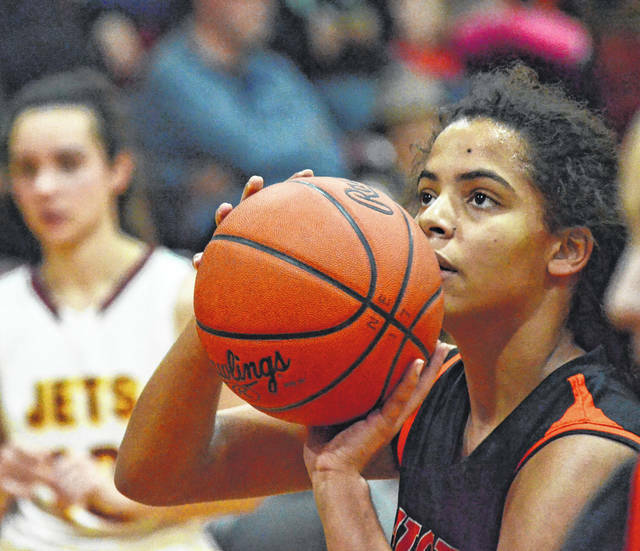 https://www.urbanacitizen.com/wp-content/uploads/sites/36/2019/01/web1_SelenaWeaver012419_ne20191242136336.jpgWest Liberty-Salem’s Selena Weaver eyes the rim during a free throw attempt against Northeastern on Thursday.